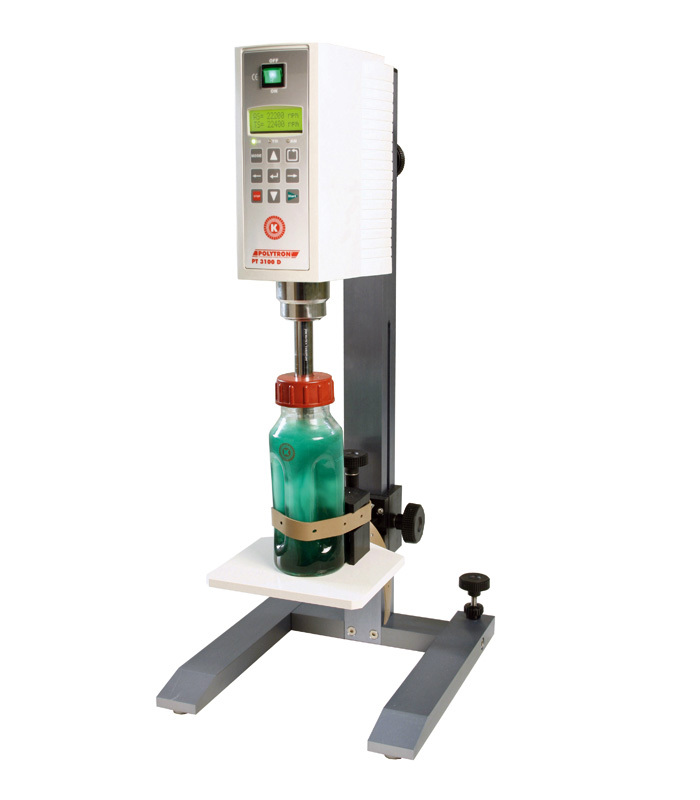 The PT3100D from Kinematica is a dispersion unit for laboratory requirements,unique in its class. Applications with highest demands on reproducibility or requiring a scale-up step are excellently served by this unit. Quick release coupling, soft start, digital display and speeds up to 40,000 rpm are built into the system, as well as rpm speed stability in the case of viscosity changes. Selected dispersing drives can be controlled from PC using the KIN software. Kinematica invented the modern rotor/stator dispersion technology that has revolutionized the dispersing and mixing processes. At the heart of the technology lies the standard or custom-made aggregates, perfected for the dispersing process. Upto 30 dispersion aggregates with different rotor/stator geometries make the Polytron® 3100 a versatile system for dispersing needs in various applications such as pharmaceutical formulation development, creation of dispersions and emulsions, dispersing of plant, human or animal tissues, resins and pigments, creation of suspensions, for the formulation of lotions, creams and food, oil-in-water(o/w) or water-in-oil (w/o) emulsions, etc. The fully digitized control and regulation system in the Polytron® 3100D is very easy to operate. The illuminated LCD display shows all the parameters , which can be changed with membrane key pad. The system achieves a tip speed of upto max 32m/sec with processing volumes in the range of 0.1 to 10,000ml. Applicable aggregates upto 36mm can easily be used. Operations can be under three modes: Standard by manual control, Timer Mode through automatic shutdown by recording speed and time and Auto Mode through complete control through the Kinematica software.